Oscar Pistorius is a famous South African Olympic runner who is physically challenged. He is missing the lower parts of his legs, and thus, runs in competitions using "blades." He also walks with leg prostheses. But now he's not famous, he's infamous. For five months, Pistorius was on trial for the murder of his girlfriend, Reeva Steenkamp, and on September 16th, 2014, the verdict came in. GUILTY! But, it's not the Guilty that most wanted. Instead of premeditated homicide, it's culpable homicide, which carries a much lesser sentence. Pistorius was born without the fibula bones. Doctors amputated part of his lower limbs when he was a child. 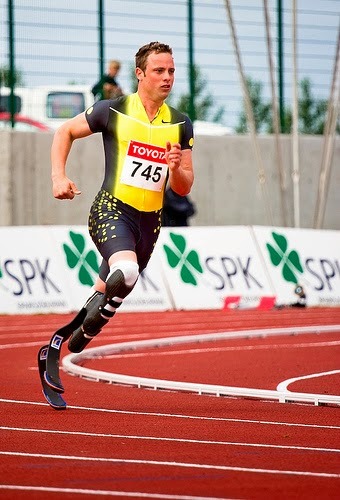 Pistorius ran competitively on carbon-fiber blades which, after much assertiveness with the Olympic commitee on his part, allowed him to compete in the 2012 Olympics. On Valentine's Day, 2013, police arrested him after he shot and killed his girlfriend before sunup. Not very romantic. Flowers would have been better. The trial began on March 3, 2014 and ended on September 12, 2014 (South African time). The judge, Thokozile Masipa, "appointed two assessors ... to help her evaluate the case and reach a verdict," according to Wikipedia.